NEKTON-Iguana contains carbohydrates, fats, vitamins, minerals, trace elements and proteins, as well as 18 essential amino acids. NEKTON-Iguana is particularly characterized by all elements that are contained in their fully unlocked form and thus available to the body immediately after it has been administered. NEKTON-Iguana ensures healthy development of the skeletal system, supports the regulated processes of molting processes, protects against nervous system disorders and preserves the functionality of the mucous membranes. NEKTON-Iguana strengthens the body, particularly in stressful situations, e.g. during molting, when settling in with new arrivals or when being moved or transported. By administering NEKTON-Iguana, the nutritional value of normal food improves considerably; NEKTON-Iguana effectively prevents deficiency symptoms and causes a significant increase in activity. No other vitamin compound should be administered whilst using NEKTON-Iguana. The protein contained in NEKTON-Iguana is already broken down into its components, the amino acids, and is thus immediately available for building up natural protein. It contains almost all essential amino acids, thus with this product, the animals' protein needs are sensibly complemented. In addition to these nutrients, vitamins, minerals and trace element are indispensable for maintaining health. Vitamins cannot be produced in the organism itself or only in insufficient amounts and must therefore be added to food from the outside. A shortage of vitamins can lead to serious, irreversible illnesses in animals. Avitaminosis (lack of vitamins) in iguanas leads to a sallow, gray-green skin color and cause the points of the crest to die off and joint swelling. Lack of vitamins from the B complex causes paralysis and convulsions. Other symptoms due to lacking nutritional conditions are, e.g. molting disorders. The vitamin content in NEKTON-Iguana is adjusted to daily food, to cover the animal's entire vitamin requirements. Calcium and phosphates are also extremely important for bone development. 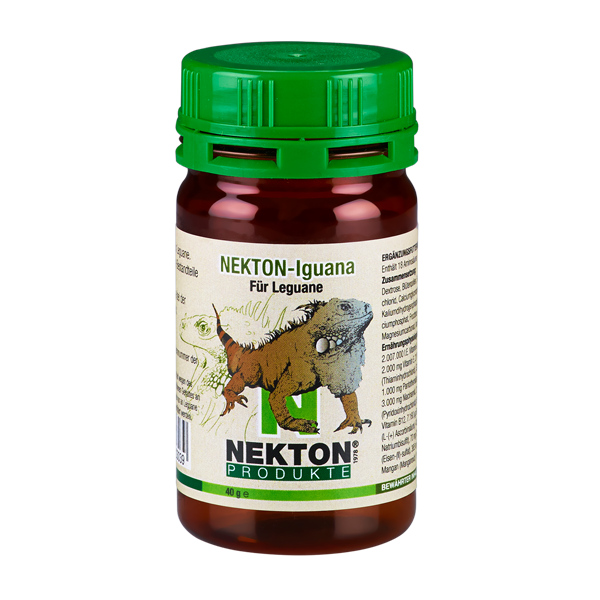 NEKTON-Iguana notably includes a high calcium supply; extra vitamin D3 has also been added. Even with a very good supply of minerals, calcium and phosphorous can be stored significantly better in the animal's bones by transferring vitamin D3. Complex usability and smooth, nutritional interaction are guaranteed. A green measuring spoon is attached to each bottle of NEKTON-Iguana. 1g of NEKTON-Iguana corresponds to one measuring spoon. Young animals up to 30 cm overall length: approx. 0.25 g (¼ measuring spoon) of NEKTON-Iguana per animal per day. Fully grown animals that are ill, weak or stressed should receive a daily dose of 1 g of NEKTON-Iguana during stressful situations. Storage: NEKTON-Iguana should be stored dry and out of sunlight, between 15° and 25°C.